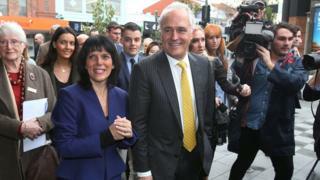 Australia’s Prime Minister Malcolm Turnbull has declared victory for his conservative coalition in last week’s closely fought general election. His comments came after opposition Labor Leader Bill Shorten conceded defeat and congratulated him. Votes are still being counted, but the Liberal-National coalition is expected to win enough seats to govern. However, a strong swing against it has left doubts about its agenda and Mr Turnbull’s leadership. The coalition still remains short of the 76 seats it needs to claim a majority in the lower house, the House of Representatives. But it should secure at least 74, and also has the support of three independent and minor party politicians – Cathy McGowan, Andrew Wilkie and Bob Katter – guaranteeing budget supply and confidence. Labor is currently on 66 seats, with five still in doubt. He admitted that the election was “a tough business”, but welcomed Mr Shorten’s calls for “common ground” in parliament. Speaking earlier, Mr Shorten admitted defeat. “It is clear that Mr Turnbull and his coalition will form a government,” he said. Malcolm Turnbull has his majority, but he is beset on all sides. Inside his party he faces a restless right wing that disapproves of his small-l liberal leanings. Opposition leader Bill Shorten is taunting Mr Turnbull at every opportunity and predicting a return to the polls within a year. The Senate promises to be unruly – several senators elect are already bickering. With Australia’s AAA credit rating under a cloud, Mr Turnbull will need to corral populist senators into passing budget cuts. The prime minister has his party’s support for now, but his enemies are watching closely. Former Australian leader Paul Keating once said Mr Turnbull was brilliant and fearless, but had no judgment. The prime minister can’t afford to put a foot wrong now. Stringent requirements for verifying votes meant the count progressed slowly after the 2 July poll. Postal votes, which are counted after votes received on polling day, heavily favoured the coalition and helped them across the line in a number of closely run electorates. The tight result is likely to put pressure on the government’s agenda, particularly in the Senate, where many independent and minor party candidates are set to take office. While final Senate results may not be known until August, anti-immigration politician Pauline Hanson is likely to hold at least three seats. South Australia’s Senator Nick Xenophon and his newly formed Nick Xenophon Team are also likely to hold three spots, while former shock jock Derryn Hinch has secured a seat. Conflicting agendas and strong personalities could make it difficult for Mr Turnbull to pass legislation through the Senate. Mr Turnbull has come under pressure both internally and externally since the worse-than-expected election result became clear on 2 July. Senator Cory Bernardi, one of the coalition’s most vocal right-wingers, called the election “a disaster” and has since made moves to establish his own conservative movement, although he denies plans to defect from the Liberal party. Mr Shorten has repeatedly called on Mr Turnbull to stand down, saying he has lost his mandate. On Thursday ratings agency Standard & Poor’s lowered Australia’s credit rating outlook from stable to negative, warning the country could lose its AAA rating unless it undertook budget repair. Treasurer Scott Morrison described the downgrade as “sobering” and said the government’s budget savings needed to be implemented. But shadow treasurer Chris Bowen said the opposition would campaign against any spending cuts that would hurt Australians on low incomes. Doubts have been raised over the passage of government’s Australian Building and Construction Commission bill, which aims to re-establish a watchdog that monitors union activity in Australia’s building industry. The bill’s non-passage provided Mr Turnbull with the trigger to call an early “double-dissolution” election where all 76 Senate seats were up for grabs, rather than the usual half. Independent MP Bob Katter has already indicated that he will withdraw his support from the government if it engages in what he sees as “union bashing”.